CAN I HAZ INSTRUMENT MACRO IN INSTRUMENT? This is what you’re able to do in an instrument: select phrases. It’s very simple, you only need a LFO and MIDI/Instrument Macro. Let’s talk about how we select a phrase normally on Renoise. Typically we either use the ZXX command, select from the list of phrases on an instrument macro module, or command the program CC. However we don’t really have that flexibility to use either of those within an instrument due to obvious things that you shouldn’t be doing like having an instrument it’s own macros. Or could we? I some how discovered this by accident. What I found out while fouling around with doofers is I CAN STUFF A MIDI/INSTRUMENT MACRO WITHIN A DOOFER, THEN THROW INTO AN INSTRUMENT’S FX CHAIN. The good thing is the macro/midi commands are only restricted to itself so you’re not modifying anything outside of itself. As for the phrase selecting and randomizer, the LFO has to be set to point mode and you’ll have to do some wacky multiple value of .788%. This will give you the correct stepping between no phrases, through all phrases, and lastly hit keymap for 100%. It’s very simple to set a doofer’s macro to a MIDI’s program automation slider so you can select a phrase. But this is not possible with instrument macro. I don’t know why, it just what it is. The only way around it is to bring in an LFO into the doofer and setup the LFO to control the Instrument Macro Mopdule. See below the LFO setup. The macro should be controlling the reset/positioning. 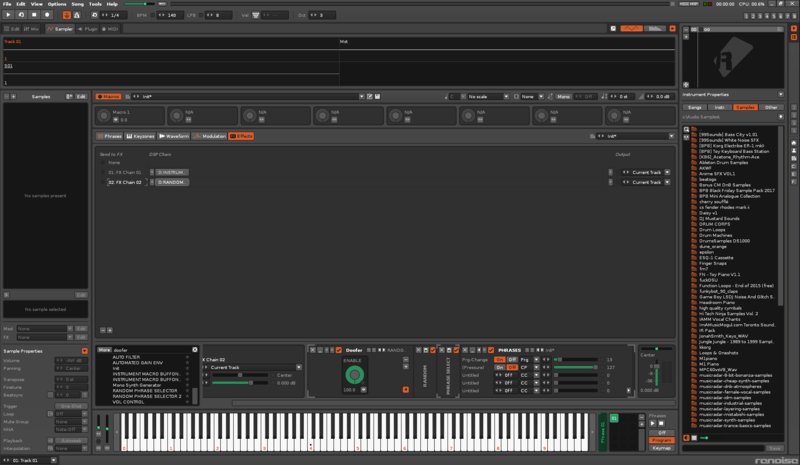 From there, I can insert another LFO and enable randomize on it. Set the destination to the LFO’s Reset and we get randomize phrase selection. Or if you want to keep it self contain, set the randomizing LFO to the macro for the example image setup above. How do you reset lfo to get the phase to sync with phrase or song?